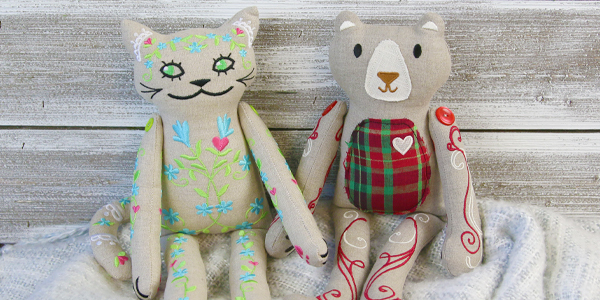 Craft a sweet, snuggly friend with these special embroidery designs! 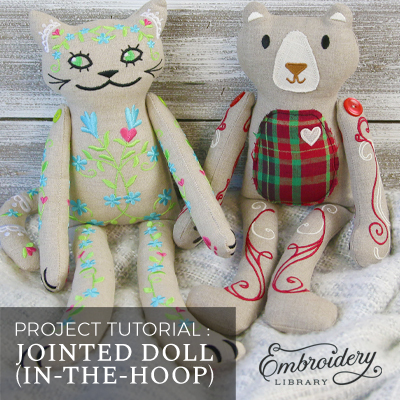 Stitch each piece in-the-hoop, then turn, stuff, and assemble. 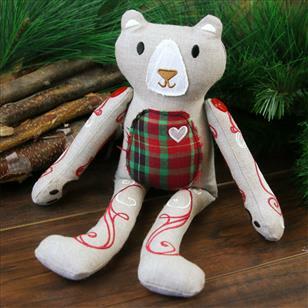 Button-jointed arms add classic charm to your cute toy. 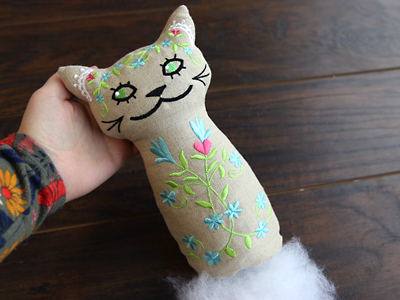 Follow the step-by-step instructions to create your own adorable creature! There are twelve embroidery files in this design labeled "a" - "l". They are all broken down into pairs (the front and backs of the same piece). 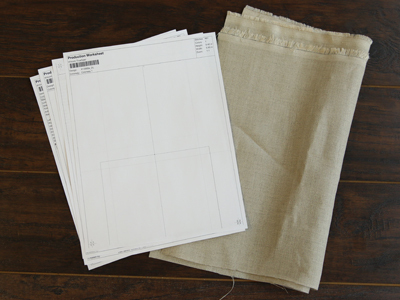 You must always sew the front embroidery file before sewing the back, because the last step of the back file sews the front and back together. For the body, "a" is the front, and "b" is the back. For the right arm, "c" is the front, and "d" is the back. For the left arm, "e" is the front, and "f" is the back. For the right leg, "g" is the front, and "h" is the back. For the left leg, "i" is the front, and "j" is the back. For the tail, "k" is the front, and "l" is the back. This in-the-hoop design has twenty-four files. Twelve are the full embroidery files. 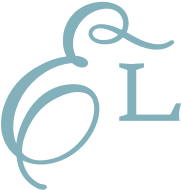 The other twelve are dieline files marked with the letters DL. 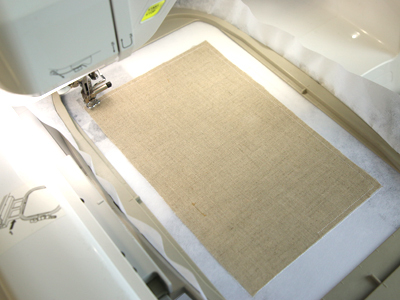 Dielines are used to cut the fabric to the right shape and size. First cut around the paper dieline for the front of the body "a", and the back of the body "b". 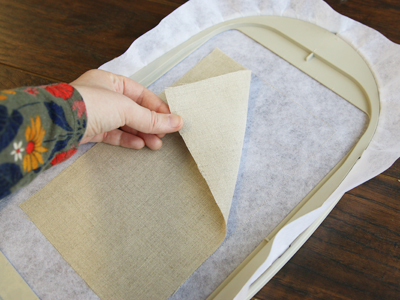 Lightly spray the back side of the paper with temporary adhesive, and smooth it onto the right side of the fabric. Make sure to label the dielines with their letter, such as "a" or "b", to help prevent them from getting mixed up. 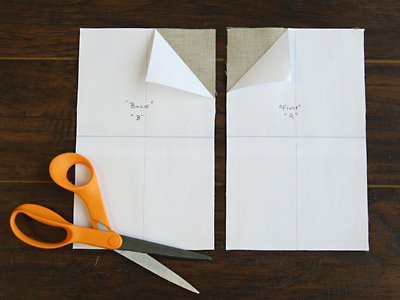 Cut out the shapes, and fold back one corner of the paper to make it easier to remove later. 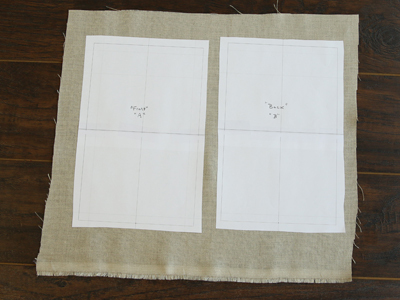 If the design has any applique pieces, repeat these steps to place the paper dieline and cut out each applique piece. 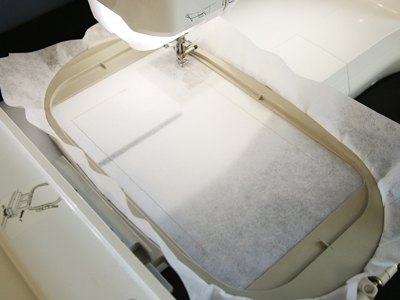 Attach the hoop to the machine and load the full embroidery design (not the dieline files) for the front of the body (file "a"). 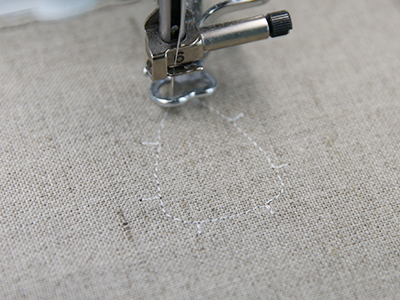 Use a size 11 or 75/11 sharp sewing needle, rather than an embroidery needle. A sharp sewing needle has a smaller, finer point than an embroidery needle, so that will make smaller perforations in the stabilizer. Embroider the design. 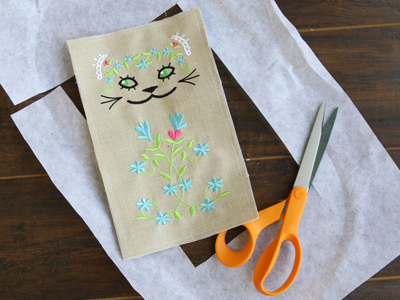 The first thing to embroider will be a dieline or outline. This marks the area on the stabilizer for the fabric piece. Remove the hoop from the machine, but do not unhoop the stabilizer. 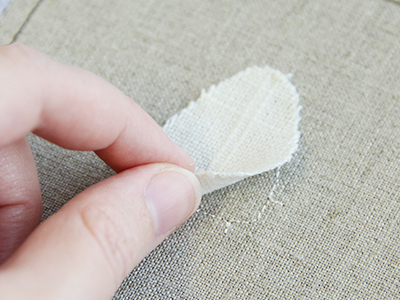 Spray the back side of the fabric piece with a small amount of temporary adhesive. Place the fabric right inside the sewn outline. 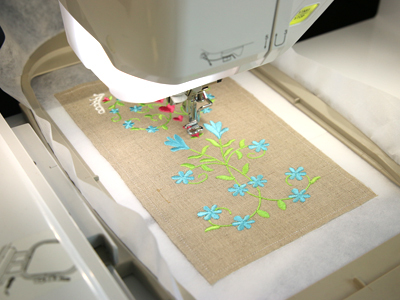 Attach the hoop back onto the machine and continue embroidering. A tackdown will sew next to hold the fabric in place for the rest of the design. 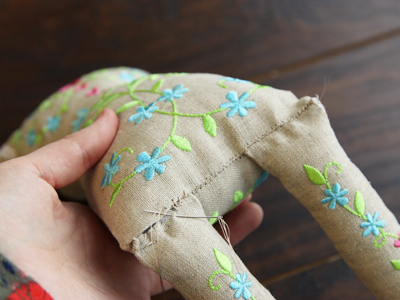 Some dolls have applique details. 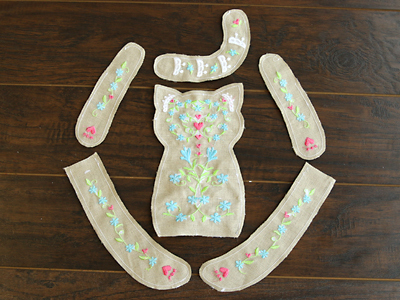 To add these, watch the color change sheet, and embroider the applique piece's placement dieline. 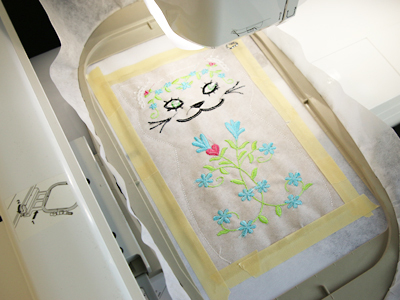 This will show where to place the applique piece on the design. Then spray the back of the applique piece with temorary adhesive, and smooth it into place. As this is raw edge applique, line the edges of the fabric up with the ends of the extending lines of the sewn dielines. 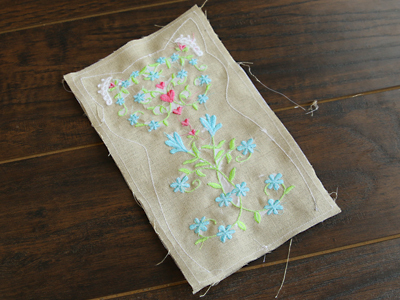 Then embroider the applique piece's tackdown step. 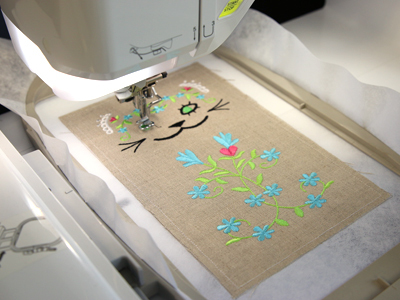 Some designs may have more than one applique piece, so watch the color change sheet closely, and always place the applique piece before sewing its tackdown. Now that the fabric is in place, follow the color change sheet to embroider all of the inner details. When the embroidery is finished sewing, unhoop the stabilizer, and cut around the fabric square to remove the excess stabilizer. Set this piece nearby, as it will be used next while embroidering the back of the body. To embroider the back side of the body, hoop another piece of tear-away stabilizer, and load the file for the back of the body onto the machine (labeled with a "b"). Then follow the color change sheet to embroider the dieline, place the fabric, and embroider the fabric in place with the tackdown step. Continue to follow the color change sheet to embroider all the inner details. 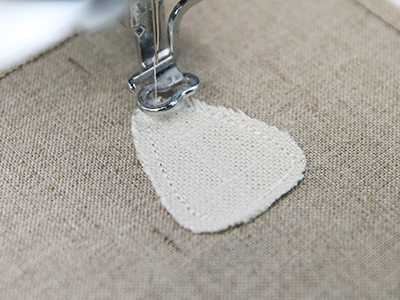 Make sure to stop the machine before sewing the "finishing seam" step. 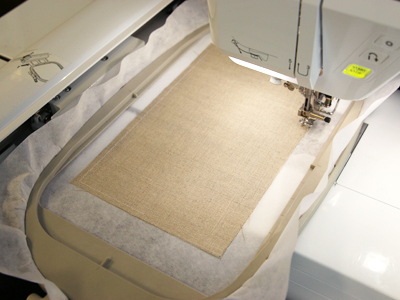 Before sewing the step labeled "finishing seam", stop the machine, remove the hoop, but do not unhoop the stabilizer. Take the embroidered front piece ("a"), and lay it on top of the hooped, back piece with right sides together. Match up the edges of the fabric, and place masking tape along all four sides to hold it in place. After the front is taped in place, put the hoop back on the machine, and embroider the "finishing seam" step. This will bind the two pieces together, and it will also sew the seam for the plush cat's shape. 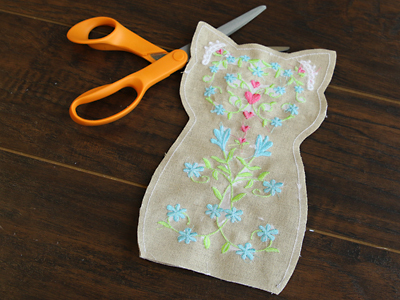 After the embroidery is finished, unhoop the design, and cut away the excess stabilizer again. 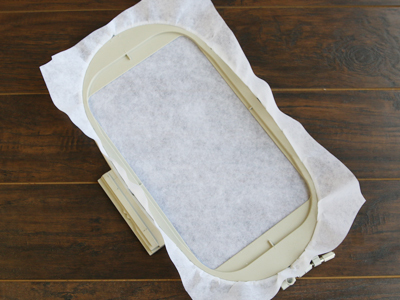 Also carefully remove all of the tear-away stabilizer from the wrong side of the fabric. 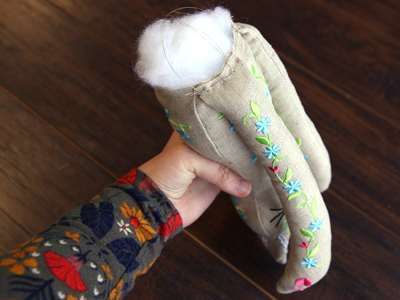 Doing this for both the front and back sides will help the cat turn easier and plump up better when stuffed. Then cut around the finishing seam (the final shape) of the cat. Make sure to leave a 1/4" for seam allowance. 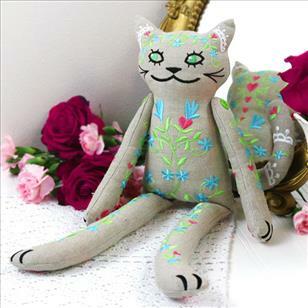 All of the arms, legs, and tail are embroidered with the same steps as the body. 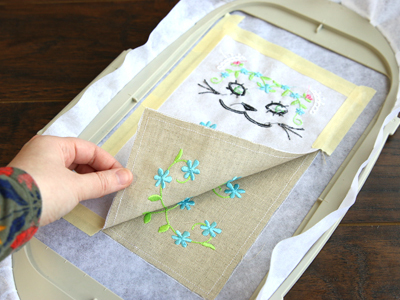 Repeat the previous steps to embroider the fronts, backs, and make sure to match them up correctly when embroidering the fronts and backs together. See the special note above to see which files are the front or back of what body part. 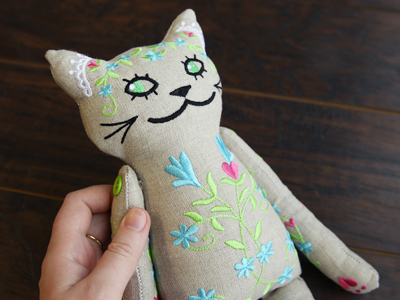 Once all the body parts of the cat are embroidered, turn the body right side out. Then stuff it firmly with polyester fiberfill. Repeat to turn each of the arms, legs, and tail right side out. Then stuff each one firmly. Make sure to leave the last 1/2" of the legs un-stuffed near the opening. This will make the legs easier to attach to the body. Now it's time to attach the legs to the body. Match up the raw edge of the leg to the raw edge of the front side of the body. Make sure the front sides of the body and legs are touching, and that the side of the legs are touching the side seams. Sew a straight stitch 1/4" from the edge to connect the pieces together. Be sure to only sew the legs onto the front of the body and not the back, and also be sure to sew through both sides of the leg. Once both legs are attached, turn all the raw edges in 1/4". 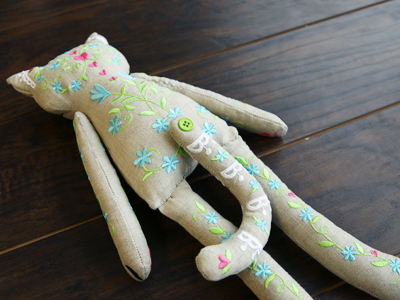 Using a hand sewing needle and matching thread, sew the opening of the body closed. 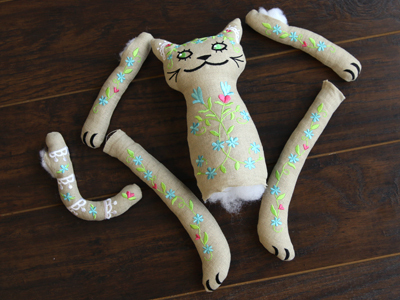 The raw edges of the body and legs should end up on the inside of the plush cat. Next, take the arms, and turn the raw edges of the opening in 1/4". 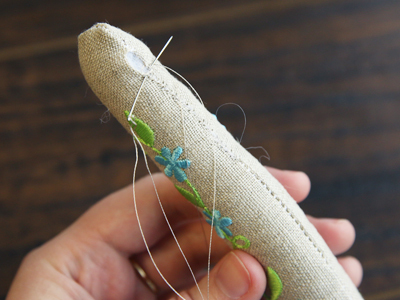 Use a hand sewing needle and matching thread to sew the opening closed. Repeat for both arms. Then take one button, and sew it onto the top of the arm. Sew through the button to attach the arm to the body as well. For best results, sew the arm directly over the side seam for stability. Repeat to add the opposite arm. Finally, add the button onto the top of the tail, and sew it onto the body. The embroidery design creates a green "X" shape out on the lower back. Hand stitch the tail onto the body right over that "x" shape. 5.85" x 8.71" | 4.61" x 6.85"